I might have left you pretty much to your own devices for the last month or so, but I have been pottering around in the background, spending an awful lot of time on facebook and making Bill’s Space known among all the calligraphy groups, of which, as the Bible would say, there are legion! I have joined in many discussions and even instigated a few, ranted about this, raved about that, generally making a nuisance of myself, but always making the point that for hundreds of people to join all these groups is great, but then to sit there looking out from their profile photograph and not joining in with anything is a great disservice to those who have spent a good deal of time and effort setting up and then maintaining these wonderful meeting places. Hehehe! I do go on, don’t I? Back to this page. Since we set up, our visitor counter is now showing 2639 from 28 countries. Hello to you all, I hope we are keeping you busy and of course well entertained. Our profile has altered slightly. i.e. Bill’s Space was set up to promote good lettering. It has now metamorphosed into an all round meeting point for artists, calligraphers and teachers, worldwide, to relax while they search for that little something different to put in their resources locker. Recently a new group, Calligraphy at Bill’s Space, has been set up on Facebook to run alongside the original site. Whether you are a beginner or have years of experience come and join in the fun. Let us see some of your work, it doesn’t have to be to any standard other than that which you have attained up ‘til now and you can always remove it later if you come up with something you feel is better, though it might be better to leave it in place to show what progress you have made. We shall soon have a look at Italics and Old English Blackletter. I have negotiated with teachers T.V. and you will see we now have a little video player with a few really interesting features. ( UPDATE. Since this post there have been changes. Teachers TV is now on line. Have a look. ) You might also have noticed that the number of links has grown over the last week or two. Even if you are not looking for resources you will find some mind blowing material to get the old grey matter working. For all the beginners I have been in contact with lately, I am really happy to be able to give a bit of guidance and support, so remember, I am right behind this screen if you have any problems. The best advice I can give in the meantime is practice, practice, practice, then a little more practice, and if that does not do the trick, practice some more. Usually the problem can be seen to be :- x height= too many / not enough nib widths, or, too much / too little pen angle to the writing line. Trying to control ink flow with the paper flat on the desk is impossible, so a board at an angle of at least 20 degrees will help with this. Mine is usually at about 40 degrees, and, a little secret here, I use a light table when ever possible. It is made of toughened glass and has a florescent tube underneath. There are commercially made light boxes available. I have various templates ready made, i.e. wedding albums, spirals, etc. I find that I can see the lines under all but the most heavyweight or darker coloured paper or card. My favourite is an A3 sheet marked out Landscape, with lines 1/8 of an inch apart. You will soon learn that you can use one, two, three, etc. lines to make an x height of 1/8, 1/4, 3/8 etc. so rather than draw lines to fit the size of your nib, you can choose a nib to fit the size of your lines. Layout wise this also makes it easier to incorporate different sized letters in the same piece. You may well ask why I marked my guideline sheet in landscape format. This is more versatile in that it can be used for both formats whereas a portrait sheet can not easily be used on a landscape piece. I can see some of you are getting confused, so I am going to leave you to get on with things and ‘speriment, but I promise I won’t leave it so long before I get in touch again. 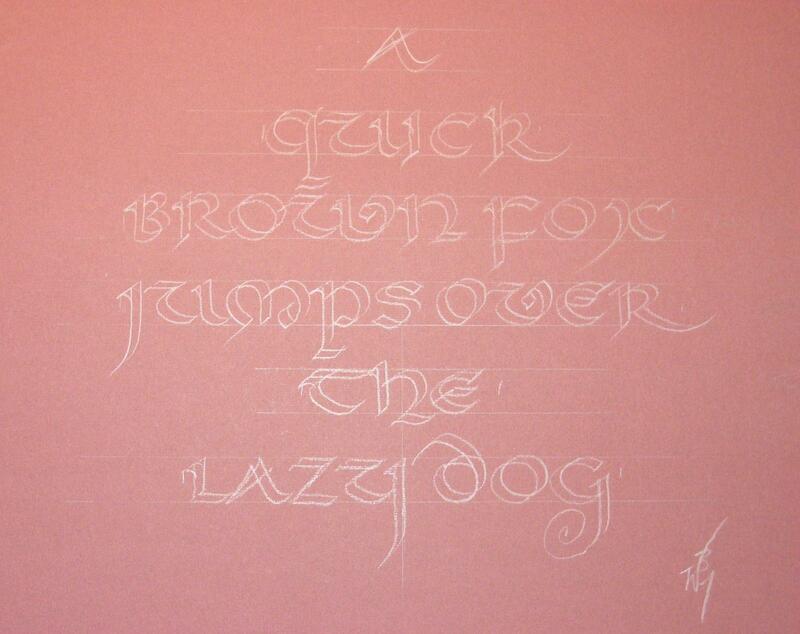 This entry was posted in ,calligraphy,calligraffiti,lettering, how to, light table, Uncial and tagged calligraphy, light table, uncial. Bookmark the permalink. Thank you! You website is just wonderful and has so many things to learn. it was a real pleasure of eyes to watch the above video on uncials.Thank you Sir.I would like you to share your videos on black letter first.Thank you. Many thanks. I am pleased you like the Uncial video and hope you have also watched the others in the series. What a haven for calligraphers! I am so happy to have found you. I love the Uncial video and the choice of Bach for the background music. Thank you for all your help on Facebook, Bill. Hey there, I hope this site is still going. I just wanted to point out that the Uncial worksheet is shrinked and the download link isn’t available anymore! Could anyone fix that? Sorry you have been having trouble seeing / downloading worksheets. I am working on updating all the lesson images. Hoping they will seem a bit better from now on. Thanks for watching Bill’s Space.